Standing in a sea of orange and blue, students and fans alike experience a sense of community, camaraderie, and companionship. If you’ve ever been to a Florida Gator football game, you know the feeling well. The familiar smell of popcorn and sweat and the sound of chants and whistles stick to your memory like gum to a shoe. Taking part in the many University of Florida traditions is all part of the fun and games of Gator football. “Chomp” along to popular cheers, get your photo taken with Albert and Alberta, and hum your favorite tune performed by the band. You’re in for a wild ride when you attend a Florida Gators football game. 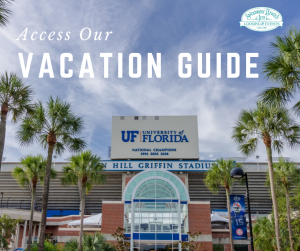 Learn more about the best attractions and things to do around the University of Florida in our thoughtfully compiled Vacation Guide! Sing along to the University of Florida fight song, “Orange and Blue!” The team’s marching band, The Pride of the Sunshine, performs it every time the Gators score a touchdown. Be sure to snag a photo with the team mascots, Albert and Alberta. Perhaps they purchased their matching UF attire at Ilene’s Gator Store, one of the best shops in Gainesville to buy gameday outfits! At the games, you’ll become familiar with a variety of chants, cheers, and even the “Gator chomp!” Listen as students and alumni shout “orange” and “blue” back and forth at one another. The Ben Hill Griffin Stadium, better known as the Swamp, is where the Gators play their home games. Home games sell out pretty quickly because of all the loyal fans. Once the end of the third quarter rolls around, get ready for roaring crowds collectively singing and swaying along to “We are the Boys from Old Florida.” This song has been a popular song at UF sporting events since the 1920s. The Alma Mater is a classic tradition! As the band plays the infamous tune, everyone in the crowd sings along. Every year, over 40,000 excited fans celebrate the beginning of football season at the stadium. Accompanied by fireworks and live music performed by popular contemporary artists, the Gator Growl is an affair you don’t want to miss! After a thrilling game full of fun University of Florida traditions, return to your home away from home at Sweetwater Branch Inn. Located in the heart of downtown near all of the best sports bars and other exciting attractions, the Sweetwater Branch Inn offers an array of accommodation options. 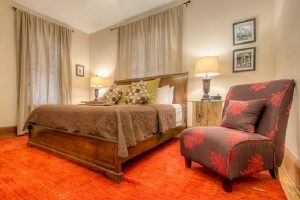 Stay in a cozy suite in either our McKenzie House or the Cushman-Colson House. You can even book an entire cottage to yourself! If you’re visiting as a group, you may want to stay in Nora-Belle’s Cottage. It is our newest renovated space and has two bedrooms and a wrap-around porch. What are you waiting for? Another Great UF Football Weekend at SWB!